← What a pleasant surprise! Comparative advantage ain’t what it’s cracked up to be! When you want to justify something, it always help s to have a theory to fall back on. 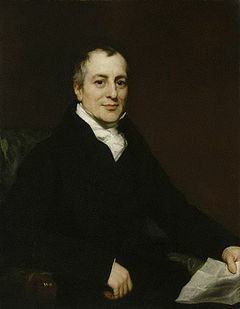 In explaining the meteoric rise of the U.S.’s trade deficit with China, many commentators harken back to the theory of comparative advantage authored by the economist David Ricardo. The theory of comparative advantages would posit that America would make televisions and ship them to China and China would make shirts and ship them to the America, even though China can make televisions and shirts cheaper than both can be made in America because of her lower wage rates, but China should make shirts because she has a comparative advantage in making shirts. But Ricardo’s theory assumed that the “factors of production”, such as capital, could not move from one country to another. Some commentators think that the current mobility of capital renders Ricardo’s theory of comparative advantage obsolete, while others don’t think it is that important. Other commentators question the applicability of the theory to our current situation of international trade. One thing that is beyond question is that China’s economic growth has been financed in large part by direct foreign investment; more than a trillion dollars in the last 30 years. Couple that with cheap wages, and you have the quintessential export platform for shipping things to this country. But I want to talk about a different kind of comparative advantage, both because I am not an economist and because I am interested in you creating jobs for members of our extended American family by purchasing U.S. made goods. You hear a lot about comparison shopping, especially with cars. We can comparison shop with cars because we have lots of information about the car. We know the size of its engine, its fuel economy, reviews of its performance, safety information, you name it. And because cars cost a lot, we are willing to take the time to comparison shop. But for lots of other types of products that aren’t as expensive as a car, we don’t bother to take the time to gather information on our choices so that we can effectively comparison shop. In those instances, about the only thing we compare between the two products is price. And since imports are often cheaper than American made versions of the same product, we buy lots of consumer products from abroad. Sandals are a good example of a product that we just kinda figure are all the same, so why not just go with the cheapest one? If you wander into Wal-Mart, you can pick up the Op – Men’s Tide Canvas Thong Sandals for ten bucks. Now if you go online to Okabashi site, you will also find flip-flops. 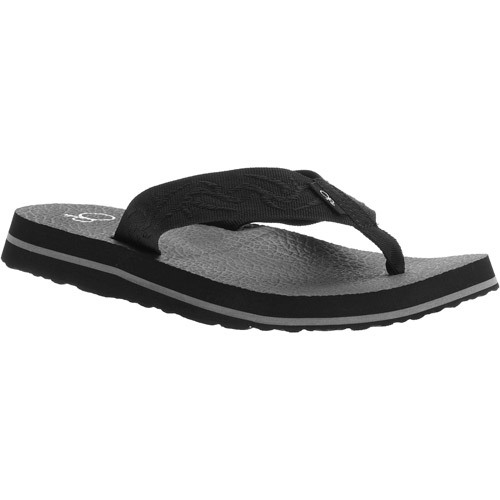 The Men’s Classic Flip-Flop is available for $16.99. Almost seven bucks more than the Op. Easy choice right? Identical flip-flops, buy the cheaper one. But a little more investigation shows that they are not identical. The Okabashi has a comparative advantage over the Op. The biggest advantage for me, as you might imagine, is that Okabashi flip-flops are made by members of our extended American family in Buford, Georgia. The Okabashi family has been making their flip-flops since 1984 in Georgia. I have no idea who is making Op flip-flops but I know they aren’t being made by Americans. But there’s more! Okabashi flip-flops are 100% recyclable, designed with superior foot support and a massaging insole. The flip-flops contain an anti-microbial agent, are anti-slip, and can even be put in the dishwasher if they get too smelly. Okabashi flip-flops contain 25% recycled material, are produced in a zero-waste manufacturing process and are backed by a 2-year guarantee. And last and probably least, they are vegan friendly, whatever that means! All that for a pair of flip-flops that costs about seven bucks more that the imported Op flip-flops and is guaranteed to last at least two years. $3.50 a year, man what a savings! I can buy one more Starbucks single tall mocha each year. Sign me up! So when you are going out shopping for anything, make sure that you are comparing imported apples to U.S. apples. Hell for me, even if the two products are the same and the U.S. one is more expensive, I’m still buying that one. But that is just me. If you want to learn more about Okabashi, please click on the links for a couple of great Okabashi videos. My Okabashi flip-flops are arriving in two days and knowing my feet, they will be in the dishwasher by the weekend. Just don’t tell my wife. This entry was posted in american made, China, Made in America, made in usa, shoes and tagged Buford Georgia, China, Comparative advantage, David Ricardo, Flip Flop, Made in America, made in america products, Made in the USA, Made in the USA products, Okabashi. Bookmark the permalink. 2 Responses to Comparative advantage ain’t what it’s cracked up to be! A lot of tool companies make two lines of tools now. One made in China and one made in USA. Marshaltown , fro instance, makes concrete tools. If you go to Home Depot you will see two different mason trwols side by side. One cost about $10.The other cost about $15. They look identical and are both made by Marshalltown. But if you pick them up, you can immeidatly tell that one is of very cheap quality and one is of good quality[ you dont even have to be a mason to be able to tell]. Basicly one is for homeowners that want to use the tool once and dont care about quality.The other is for actual construction workers that want a toll that will last longer than a week . Needless to say ,the cheaper line is made in China and the quality line is made in America.